In terms of the Terms and conditions for the competition (6.1), I would like to verify the information, whether a foreign (Portuguese) architectural studio can participate in this competition. The main architect (leader) of the studio is an authorised architect in Portugal. I would like to ask: is it possible to place proposed development at the area "stabilized areas with the possibility of free plots intesification"? In my opinion ,/new developmental areas /new build-up area/ themselves are not suitable for the task. Yes, proposed development can be placed at areas, which are marked as "OV č.33", therefore areas, which are intended to be developed: "stabilized areas with the possibility of free plots intensification" (homogenous bright green colour) and "developmental areas /new build-up areas/" (thin black hatch on white background). Do we need to consider reconstruction of existing object? Is it possible to modify/change it?. Proposal of reconstruction of the main building is not a topic of this competition. After our visit of existing building, our opinion is, that all interior spaces need to be reconstructed. Does competition deal with their reconstruction? If not, why? A sketchup file was mentioned as competition instrument but we are not able to identify this file. Where can we download it? This was announced in the file "Informativny dokument sutazne podmienky.pdf", which was available since announcement of the competition in ERANET system, together with other competition instruments. In chapter about Ground Plan of the Machnáč Zone (UPN-Z) at page 8 it is explicitly communicated, that new development can be placed only at areas which are intended to be developed. In the meaning of the map key of drawing UNP-Z it is the area above service communication (developmental areas - new build-up areas). This means that all required programme needs to be realized in this area (between communication and north-east border of AFAD area). According to another drawing of UPN-Z ("výkres 2-Z2 - komplexné urbanistické riešenie / complex urbanistic design) it is possible to build at the area "third block of school", on the meadow on the south-east face of existing building. Is it possible to define, where can be development designed, respectively to explain this conflict? In the meaning of the answer to question no. 2: proposed development can be placed at areas, which are marked as "OV č.33", therefore areas, which are intended to be developed: "stabilized areas with the possibility of free plots intensification" (homogenous bright green colour) and "developmental areas /new build-up areas/" (thin black hatch on white background). It is not clear, if it is possible to build on "stabilized areas with the possibility of free plots intensification". We have doubts, if Aula with 800 seats is not too big for Academy's needs. This requirement is based on current number of students (cca 660) and pedagogues (cca 120) and is considered to be adequate. Is it possible to provide previous projects dealing with the topic of AFAD area (Artcampus)? Before the start of organisation of actual competition, it was discussed at relevant forums of AFAD, whether to use previous projects dealing with the topic of this area. These discussions were closed with voting of pedagogic part of Academic community of AFAD and student part of Academic senate of AFAD with the result, that competition will be announced without requesting of compliance with older urbanistic conceptions. In the meaning of this, no previous designs of this area will be provided by AFAD as competition instruments for ongoing competition. We still can not access sketchup model and photos. While using provided link we get the answer "The folder ‘/_shared/2018 10 19 Art campus’ doesn’t exist." I would like to ask about slope near Drotárska cesta. In materials, which were provided, it is marked as "extension of high deciduous greenery - areas not to be built-up". Is it possible to place parking here? Based on consultation with author of ground plan of the zone, we inform, that it is possible to propose parking, respectively garage with green roof to reasonable extent, maximal 30 % of area. Near Drotárska cesta there should be tree alley, rest of area will be planted with trees. In materials which were provided, it is mentioned, that "main teaching building is the torso of the modernist monolith of the original architectural design - it has not been able to build its third block, as well as other buildings and parts of the academic campus". Does Inviting Party not find this project relevant to be provided? According to answer no. 9 - no, because none of old projects is determining for new design. Is it possible to propose underground buildings, parking areas and access routes, which would be part of greenery in the area between AFAD building and Drotárska cesta? According to answer no. 11 - based on consultation with author of ground plan of the zone, we inform, that it is possible to propose parking, respectively garage with green roof to reasonable extent, maximal 30 % of area. Near Drotárska cesta there should be tree alley, rest of area will be planted with trees. There are objects at areas OV č.33. Is it necessary in terms of service of the area to preserve some of these objects, respectively to move the technical equipment that they contain? Objects which are around the main teaching building can be considered for removal. Is it possible to provide more detailed information on supply vehicles which are used for operation of workshops? Types of their sizes, approximate count, frequency of visit per day. Garbage trucks needs acces for garbage removal. A vehicle carrying a large container of 5 or 10 cubic meters comes 2 to 3 times a month. Material supply (wood, metal ...) is usually provided by trucks with a length of hull up to 7 meters, with a different frequency of visits, usually 1 to 3 times in 3 months. In exceptional situations (approximately once a year), it is necessary to allow the access of a semi-trailer truck (import of a large technological equipment, a material of an extraordinary size) or large vehicles used for film-shooting. Do underground stories count as built-up areas, if there is not built up/paved/green area on their top? In the meaning of definition of "built-up" area, as it is defined in chapter 2.2.1 of obligatory part C of Ground plan of capital city of SR Bratislava, Changes and amendments 2, built-up area is "area of orthogonal projection of outer perimeter of vertical constructions of the largest part of buildings, which can be perceived above terrain into horizontal plane. Area, which is above underground stories without overground part of building counts into paved areas, respectively green areas, according to its character, with taking into account table for counting of greenery, which was published in the same chapter of the Ground plan. How do you picture operation of canteen. Is the kitchen for preparation of all meals needed, or is heating-up of foods sufficient? A kitchen for preparation of meals should be part of a design. n a ground plan there is a limit of 4 floors for height of new objects. This height is not defined in metres. Can you tell, if there is any maximum height limit of the new objects, respectively, if their height can exceed existing building? According to ground plan, maximum height of new buildings is not limited in metres, height of new objects can exceed existing building. Is is necessary to consider intention of new development on plots behind north-west border of AFAD areal. There is an intention of building new single detached houses, as is outlined in a drawing of Ground plan of Machnáč, Accessories and amendments, 2005: (https://bratislava.blob.core.windows.net/media/Default/Dokumenty/Str%C3%A1nky/Chcem%20vediet/UPNZ-Machn%C3%A1%C4%8D,%20ZaD%202005,%20Komplexn%C3%BD%20v%C3%BDkres.pdf). Can we work with premise, that some of the spaces at 1st storey, which are related to activity of new centers, will be moved into new technological pavillion? I would like to ask, what are requirements for daylight for activities in technological pavilion? Workshops and other workplaces in technological pavilion will serve for daylong long-term stay of students, pedagogical and non-pedagogical employees, which should be considered in design of lighting/illumination according to valid regulation. In the urban plan ""Outline of the Ground Plan of the Machnáč Zone - Amendments, 2005" one caption is missing for grey hatching, please find attached the pdf of this document, can you please explain what this hatching means? Caption of this hatching is not missing, it is "extension of high deciduous greenery - areas not to be built-up" which is listed under "other significant areas and lines". By catering facility it is listed, that required capacity is 100 eating places/seats. Is it expected that breakfast, lunch and dinner will be served? What is maximal amount of portions, which should be served daily? Yes, it is expected, that breakfast, lunch and dinner will be served. Exact number of portions is not set. But it is assumed, that canteen will be used by residents of dormitory and partialy by other students and pedagogues from other parts of campus. It is welcome, that amount of served visitors could by the biggest possible (ideally 800 portions/day at maximum), while maintaining requested capacity of 100 seats. In documentation of existing building, there are drawn 4 floors. Does this object have another underground stories, which are not drawn in documentation? If yes, under which part of building? Existing building has 1 underground storey under south-west tract - the one which is facing valley. There are spaces for technical equipment of building. Is the number of presentation panels (4 pieces) binding, or is it possible to raise this number for the reason, that it is not possible to fit everything on original 4 panels. Number of panels 4 is binding. In case, that according to way of solving assignment it is not possible, that 4 panels will contain all content in requested scales, it is possible while maintaining requested level of detail of plans and sections illustrating design for facilities in 1st and 2nd phase, to scale them down, so they can fit in panel. We are having difficulties to know with total certainty which areas are adequate for build up, optional or even prohibited. We would appreciate some clarification in regard to the areas that are adequate for building and therefore for placing the proposal in them. In order to clarify it as much as possible, we are attaching a simple diagram with the three main zones (A, B, C) that we have considered within the site boundary. (Please see attachment). Would you please provide us a feedback about the possibility of each of these three areas for buildup or their prohibition? Zone C: adequate to be built-up. The brief requires the option B cell: cell consisting of two double rooms sharing a toilet and a bathroom with a capacity of 4 students. Concerning the Library Use, apart from having the measurement of book quantity in the brief, we would like to know if you would have more information regarding on how those books would be managed. In terms of space and general surface required we feel it varies greatly if we consider the stock being in a deposit with some extraction method or whether they would all be accessible freely anytime by any user of the Art Campus. We would like to know if these concerns are a matter that depend of the design proposal or if we should follow a specific indication. The library is meant to be built prospectively. Mentioned topics are left to participants. We have some questions about the requirements of the Free-Time Zones. Is there any specific character in mind that we should consider? As, for instance, having both exterior and built free spaces? Or is it up to us and our proposal? There is no strict requirement for the character of Free-Time Zones. Solution is left to participants. For what number of students and teachers should we adjust capacity of the toiletes in the technological pavilion? Currently there are 462 students and 105 employees in the existing building. It is expected that part of them will move to the technological pavilion. Exact number of people, that will be in technological pavilion on daily basis will depend on the amount of work during academic year and therefore will be very variable. It can be assumed, that in seasons of maximal traffic, it will be up to 250 people - students and employees altogether. In the document Art Campus 06 (Art campus - 06 - vynatok z uzemneho planu zony - extract from ground plan of the zone) it is mentioned, that it is an „unacceptable way of building: (…) section pooling“ could you please specify what is meant by „section pooling“? It is a way of building that is irrelevant to current competition's subject. While working-out proposal, there is not needed to take this requirement of ground plan of the zone into account in any way. Is it allowed to present realistic renderings on the panels to illustrate the concept of the proposal? In the "Terms and Conditions for Public Anonymous One-Round Architectural and Urban Design Competition - Art Campus of Fine Arts and Design in Bratislava, 2018" under "9.2 Delivering the second part of the proposal participants", foreign offices are asked to state the address of the organisation equivalent to the Slovak Chamber of Architects. Why is that? Is it also possible to state the address of the Slovak Chamber of Architects or the address of the Inviting Party only? Purpose of this point of competition's Terms and conditions is to maintain anonymity of contestant while sending and receiving of envelope with documents. Foreign offices can use address of Slovak chamber of architects as an address of sender. We would need to know, if the cinema in technological pavillion should be a cinema in true meaning of the word, with all relevant requirements and prescribed shape of auditorium. Cinema hall which was requested within "Teaching and Presentation Centre" doesn't need to meet all requirements and shape of auditorium, as it would need if it is a cinema in true meaning of the word. In the question no. 23 the presence of an underground floor is highlighted. Is it possible to get more informations about it, e.g. floor plan, section, exact position etc.? The announcer provides new material which describes this underground level: :"Art campus - 11 - podzemne podlazie a aktualizovany rez – underground floor and section actualisation.dwg". – Classrooms and lecture rooms - 2 classrooms (for about 25 students) - Should each of these classrooms have capacity of 25 students, or is it together? – Department of Theory and Art History - 6 classrooms (for about 25 students) - Should each of these classrooms have capacity of 25 students, or is it together? – 2 lecture rooms (for about 120 students) - Every room for 120 students? – Academic Library - We ask to define "Communication Centre for about 30 students". Classrooms and lecture rooms - 2 classrooms, each of them with capacity of 25 students. Department of Theory and Art History: - 6 classrooms, each of them with capacity of 25 students. 2 lecture rooms, each of them with capacity of 120 students? Communication Centre in Academic library for about 30 students - a place within Academic library, where it is possible to talk aloud. 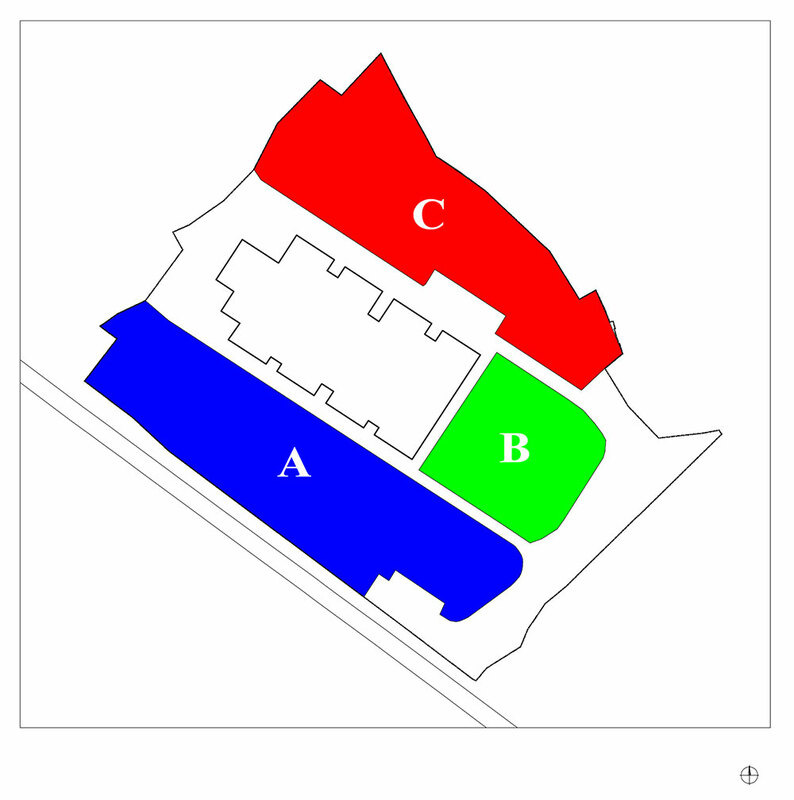 Is the Aula (Teaching and Lecture Pavillion) considered to be a big Auditorium (sloped fixed seats) or a big flat hall which can be furnished in various ways (tables, seats, empty)? The Aula will serve primary for lectures, academic ceremonies and other events of Academy (assembly of academic community, etc.) and secondary for cultural and other formal actions. Specific solution in the meaning of the question is up to competitors. Is it possible to affect existing roads (road situated in AFAD areal, which is circling around existing building) with new buildings, or is it possible to change profile/trace of this road? Yes, it is possible, but is also welcome, that proposal will still count with some form of road in AFAD areal, so it will be possible to continue with supply of material with large vehicles, as was described in more detail in answer no. 5. We have a question about the two existing building in the built up area, north of the main building, is it possible to rebuilt or integrate them in a new building? If it's possible can you please explain what is the function of this two building? In the meaning of answer no. 14 - these objects can be considered for removal. Their function is storage and supplementary and while other requirements of assignment will be fulfilled, it is not necessary to take functions of these buildings into account. Does Dormitory needs to have controled entrance (doorman), or does Announcer have no preferences? Announcer lets competitors to provide their solution for this. If their solution will count with other way of control of entry (not centralized gate), it will be accepted. The requested blank square (30 x 30 mm) on the layout, does it have to be marked (visible with an outline) or is it enough to leave some blank space on the layout sheet? Square with outline with blank space inside is preferred. We have a question regarding documents. Is it necessary to stamp them, or is it sufficient to sign them by authorized person (authorized architect)? It is not necessary to put stamp of authorized architect on documents, but we would like to highlight, that authenticity of signatures in Annex no. 3 must be officially verified. Terms and Conditions 6.2 – There are mentioned two ways of proving of fulfilment of requirements. Do we understand it correctly, that it is needed to provide ONLY ONE OF THEM until the start of direct negotiation procedure? Yes, as it is mentioned in Terms and Conditions, it is sufficient to provide one of listed ways of proof. How is defined "start of direct negotiation procedure"? Is it a moment of invitation to negotiation by Announcer of the competition or is it the date of first negotiation? Direct negotiation procedure starts on date of sending a notice about its start. Terms and conditions 6.2 - demanding of documents according to (ii) usually takes 30 days, similarly document according to (ii). Will prospective invitation to negotiation procedure in the case of winning competition tolerate this time period? Since without these documents it will not be possible to start direct negotiation procedure. Yes, Announcer will provide sufficient amount of time since the moment, when the result of competition will gain its validation, until the start of direct negotiation procedure. Winner of competition will have objectively sufficient time to fulfill requirements, which are demanded of him. Announcer accents, that he has intention to contract winning competitor. Terms and conditions 6.5 – Annex 3 (Agreement on Compliance with Conditions) is submitted in 3 originals with officially verified signatures (notary), correct? Terms and conditions 8.2 – Do we understand correctly, that panels with proposal are submitted ONLY DIGITALLY? Yes. Printing of panels with proposals will be provided by Announcer on his expenses. In the case of documents which are signed or include a stamp, these shall be submitted in electronic form, stating the name and surname of the persons who signed the documents and the date of signature, without stating the signature of those persons and the imprint of the stamp. We assume, that it aims on document "ucastnik.pdf". Does it mean, that Annex 1+2+3 will be in digital form only with inserted data, but without signature and stamp? Does it mean, that annex 3 will be scanned until its verification by notary? What is the meaning of submitting this unauthorized documents? Yes. Digitally submitted scans of these documents will serve for archiving. Competitor commits, that in the case of winning competition, at the latest until the moment of sending INVITATION TO NEGOTIATION he will be able to provide fulfillment of requirements (Tax Office, Social Insurance, Trade registry etc.). Acquiring of these documents from public institutions usually takes 30 days. How is it secured, that winner will be invited by Announcer after expiration of this time period? Otherwise winner will have to pay a fine of 45 000€, since he does not have an influence on the moment, when will the Announcer send invitation. Do we understand correctly, that by the reason of protecting self, it is suitable to acquire demanded documents immediately, since expected deadline for announcement and publication of results is 6 February 2019 and Announcer can theoretically invite winner to negotiation immediately and winner will not have sufficient time for acquiring of documents? In the meaning of answer no. 44: Announcer will provide sufficient amount of time since the moment, when the result of competition will gain its validation, until the start of direct negotiation procedure. Winner of competition will have objectively sufficient time to fulfill requirements, which are demanded of him. Announcer accents, that he has intention to contract winning competitor. Are storehouses of wood and sawdust, which are situated outside of the main building included in the Assignment, or is it necessary to add them in case of their removal? In the meaning of answer no. 38: these objects can be considered for removal. Their function is storage and supplementary and while other requirements of assignment will be fulfilled, it is not necessary to take functions of these buildings into account. I would like to ask considering possible modification of Ground plan (in area "extension of high deciduous greenery - areas not to be built-up") if it is possible to count with another function as parking? While respecting demand for keeping 30% of area, green roof, etc. For the purpose of this competition it is necessary to abide valid actual Ground plan and guidance, which was provided after consultation with author of Ground plan of the zone in answer no. 13. In the meaning of this, it is not possible to consider area "extension of high deciduous greenery - areas not to be built-up" for another use of building. I would like to ask about Technological Pavilion - aiming on requirement of possible acces with trucks to storages of single centres – does every storage need to have single and direct access with car or is it sufficient one common access to shared drive-through hallway, where the goods are distributed further? Both mentioned solutions are acceptable. We assume, that draft of the Contract of Work (Article 15 of Terms and Conditions) and list of points according to Article 15 of Terms and Conditions are of purely informational character and Contract will be not submitted filled. Is this correct? Contract of Work will be not submitted by participant in this competition. As competitor from Slovakia, we fill only Slovak version of document according to clause 8.3.i (Annex 1, 2, 3). Is this correct? Page 9 of Terms and Conditions, clause 9.1. - The first part of the proposal is not marked down. We ask to explain. It means, that boxes in the top right corners of the panels will be left empty. We ask for information, if in the case of defective file we receive information about its failing (with possibility of correction)? Proposals, which competitors upload into Eranet system can not be according to law displayed before expiration of deadline for submission of competition proposals. Thus we can not check, if the file is functional. It is possible, if competitor has any doubts about functionality of file after its upload, to recall it, and send again, until expiration of deadline for submission of proposals. In Annex 3, II. 2.5 a natural person undertakes to guarantee commitments of legal person, in connection with paying of contractual penalty of 45 thousand €. In our case, the participant is a legal person. Is it obligatory for us to fill this part? Would it be considered as an non-fulfillment of Terms and Conditions and disqualification from competition in a case, that we do not fill this? In clause 6.5 of Terms and Conditions it is stated, that: "the participation in the competition is subject to the submission of a duly completed and signed Agreement on Compliance with the Conditions according to the Annex no. 3 by the competition participant". In the meaning of this, it is needed, that the Agreement on Compliance with Conditions (Annex no. 3) is filled completely. Violation of this requirement would be considered as an non-fulfillment of obligatory requirement and as it is defined in clause 17.2, proposal would be excluded from the assessment. – in this part, it is not needed to provide any documents to the date of submission 21 January, correct? – Neither European Single Procurement Document, nor listing from Business register, nor confirmation of registration in List of economic subjects lead by Office for public procurement, right? In a manner of confirmation of fulfilling terms of participation in this competition, it is needed to submit just documents listed in clause 8.3. European Single Procurement Document, listing from Business register and confirmation of registration in List of economic subjects are not amongst these documents and are not submitted in this competition. – In this part participant uploads two things: panel.pdf and ucastnik.pdf, correctly? – In this part, file 10 with bilancies is submitted until date of submitting 21 January, right? Simple statement of planar and spatial bilancies should be a part of panels with proposal, as it is defined in clause 8.2 of Terms and Conditions. This table is not submitted as separate file. In the meaning of clause 7.3 Communication and language of the proposal, it is needed to provide proposal in bilingual form - does that mean, that text (approx.3 normpages), which is part of presentational panels, should be provided in both languages (Slovak, English)? Anex 2: in a case of foreign author (self employed), what information are required? registering authority: ... for example Tax Office? registration (section, insert, register number): ... ? in case of self employed there is no statutory body, only self employed himself? – registration - way and number of his registration, if there is entry different to ID. In the case of self employed, statutory body is not filled, since it is self employed himself. Announcer highlights, that in the case of win in this competition, direct negotiation procedure will be lead with the same participant. is amongst Annexes, but does not figure in clause 8.3. Can I understand that in a way that it does not need to be submitted? European Single Procurement Document is not submitted in this competition. balance sheet according to clause 8.2 is inserted to presentational panels and is not submitted as separate file, do I understand that correctly? We have a question about Terms and Conditions, in more precise Annex no. 3 (document sample according to clause 6.5 of Terms and Conditions). Can the Annex (Agreement on Compliance with Conditions) be verified by notary in Czech republic or by Czech postal office? Yes, signatures on this document can be verified by notary in Czech republic or by Czech postal office. We would like to ask a question about the required rooms in the teaching studio pavilion. In the assignment, 4 studios are required for the Department of Painting and Other Media (for about 25 students in 2nd - 4th year of study + approx. 15 students II. Stage of study + Approx. 5 students III. stage of study ), Is this meant like each atelier must have capacity of 45 students so we are designing 4 studios each for 45 students or is this meant like 2 studios for 25 students, then one for 15 students and one studio for 5 students? The same principle then applies to the Department of Architectural Design, 4 studios for 65 students each or 2 studios for 35 students, 1 for 20 students and 1 for 10 students. Thank you for the answer. 4 studios of Department of Painting and Other Media will serve for 45 students altogether. 4 studios of Department of Architectural Design will serve for 65 students altogether. I am a registered architect in Spain in the COAM (Oficial Chamber of Architects of Madrid). I am also registered as natural person individual independent professional in Spain for the profesional practice of Architecture and related economical services. As the penalty defined by Annex no.3 is quite high, I would like to make sure that these conditions that I have correspond to the ones defined in Act. no. 343/2015 Coll. of the Act on Public Procurement and on Amendments to Certain Laws, as amended (the “PPA”) (in its section 32 and 39). And also in the Section 4 of the Act. no. 138/1992 Coll. on Authorized Architects and Authorized Building Engineers, as amended (the “AAA”) or the authorization of the Slovak Chamber of Civil Engineers pursuant to Section 5. Could you please provide me a verification? Regarding the provided information (“registration in the COAM, registration as natural person individual independent professional in Spain for the professional practice of Architecture and related economical services”) we consulted the representative of the Slovak chamber of architects (further referred to as “SKA”). However, given the limited information you provided, they were not able to give us a founded answer on whether you meet the requirements on professional competence (licence to provide services according to § 4 or § 5 AAA). For a more quick and effective verification of the questioned requirements please free to contact Ms. Olga Mihalikova (e-mail: mihalikova@komarch.sk, phone numbers: + 421 911 443 414 and + 421 2 544 312 54) who is in charge of the agenda of recognition of foreign education, licenses and degrees of the SKA. We suggest you to present her with information on your acquired education and membership in professional chamber. The recognition of professional competence fulfills the condition for participation according to the par. 6.1 of the Terms and Conditions, but does not automatically make you fulfill the conditions according to par. 6.2 and 6.4. We would like to inform the participants, that the conditions for compliance with par. 6.2 and 6.4 are provided in more detail in the 1st chapter of the Agreement on Compliance with the Conditions (Annex no. 3, especially par. 1.2.2. Furthermore, as the above mentioned Act. no. 343/2015 and Act. no. 138/1992 have not been provided and they seem to determine a crucial Contractual Penalty, I would really appreciate to have an English version of them prior to the signature and submission of Annex no.3. The compliance according to Law 138/1992 reflects the par. 6.1 of the Terms and Conditions and it is possible to verify their fulfillment via consultation with the SKA, as suggested in the answer no. 66. The compliance according to Law 343/2015 reflects the par. 6.2 and 6.4 of the Terms and Conditions, and the requirements are given in more detail in the 1st chapter of the Agreement on Compliance with the Conditions (Annex no. 3). In case you are interested in obtaining a english version of the above mentioned Laws, we suggest you contact the Slovak embassy or consulate in your country or some Slovak law firm. Could you please verify the conditions determined by ‘Article 11 of the PPA’ that are needed to be proved by submitting the relevant confirmation in case of the participant becomes a winning participant? Art. 11 PPA requires the winning participant to be registered in the Slovak register of the partners of the public sector. The participant proves the compliance with this requirement by submission of a certificate that is being issued by the District court of Zilina, as the organ that administers the register for the whole Slovak republic. The participant may obtain the registration by means of a Slovak attorney, notary, bank, auditor or licensed tax advisor. The purpose of such registration is to declare the final beneficiaries of the participant. It is a measure introduced in the Slovak republic in order to prevent corruption. I would like to know if any of the above mentioned Conditions determine a further requirement that has not been explicitly stated in the Competition Terms and Conditions. For instance, the requirement of a minimum amount of economic turnover in the past years; or the requirement of previous constructed buildings; or any other possible restriction that would condition the participation in the competition. Previous constructed buildings of the participant is not required. For all the above mention concerns: Do they apply exclusively to the winner of the First Prize of the competition? Or also to the Second and Third Awardees? The winning participant who will be invited to the direct negotiation process, is then required to submit the documents proving (i) compliance with the requirements given by par. 6.1 during the time frame since the delivery of the participant’s proposal and (ii) compliance with the requirements given by par. 6.2 and 6.4 at the time of invitation to the direct negotiation process. Participants at second and third place will note provide these documents. For the authentication of the signature of Annex no. 3, is it valid to have signed it electronically with the Official Electronically Proof Signature of the government of my country? As that signature provides a code that can be verified digitally, we understand that the physical copy would be also valid in that sense. Could you please verify that? In case the legal provisions of your country allow a means for official authentification of your signature by notary or other public administration body, the Agreement on Compliance with the Conditions (Annex no. 3) shall be submitted with the authenticity of the signatures being verified in this manner. Otherwise the Agreement on Compliance with the Conditions (Annex no. 3) shall be submitted with the authenticity of the signatures being verified by means that are common in your country. In the meaning of answer no. 24 - yes, in case, that according to way of solving assignment it is not possible, that 4 panels will contain all content in requested scales, it is possible while maintaining requested level of detail of plans and sections illustrating design for facilities in 1st and 2nd phase, to scale them down, so they can fit in panel. Do the panels have to be bilingual? Slovak + English? In question no. 68 it is stated: Art. 11 PPA requires the winning participant to be registered in the Slovak register of the partners of the public sector. The participant proves the compliance with this requirement by submission of a certificate that is being issued by the District court of Zilina, as the organ that administers the register for the whole Slovak republic. The participant may obtain the registration by means of a Slovak attorney, notary, bank, auditor or licensed tax advisor. First of all we would like to know if that registration correspond to the one we have already done through ERANET in order to participate in the competition. As a foreign architect and in case of being a different type of registration we would like to know if it might be done after the notification of the results. It is a different type of registration. The registration in the Slovak register of partners of the public sector may be carried out in the time frame between the communication of results of the competition and the invitation to the direct negotiation procedure.The inviting party reassures the participants that will provide them with enough time that will be objectively sufficient for the performance of the registration. In case that the winning proposal wouldn’t meet the requirements stated in Annex no.3 after the notifications of the results of the competition. Would it be possible to partner a Company, Architect or Engineer that would meet and fulfill all those requirements even if it is after the notification of the results? The requirements stated in Annex no. 3 must be met by the entity (natural person or legal entity) that will be identified as participant of the competition. According to the legislation, only that entity may be invited to the direct negotiation procedure. In case you are not sure whether you meet the requirements or not, we would like to draw your attention to the possibility of establishing a partnership with another entity (natural person or legal entity) which with no doubt meets the requirements and submitting the proposal by that entity as participant. The ground plan lost its binding effect and became only a guidance. The fact that along the Drotarska street are being permitted also more than 6-floor buildings, we consider the interpretation of the ground plan too oversimplifying and narrowing the possibilities of such a important institution, as VSVU. Though, the project of Art Campus will in any case require a new area regulation procedure. We do not understand the strict interpretation that doesn’t allow for construction (except of parking lots) in the school’s foreground (Parcel A). It contradicts the Bratislava municipal plan. In case a participant does not follow the oversimplified and disputable interpretation, will that have the proposal’s rejection at the verification of proposals as consequence? Or proposal’s rejection at the evaluation of proposals? We would like to remind you that the interpretation on the answers is independent from the process of obtaining the building permit. – providing of the answers to the requests no. 2, 6, 7, 11, 13, 16, 18, 21, 25, 30, 50. These guidelines were sent to registered participants via the system ERANET and simultaneously were published on the competitions’ website www.artcampus.sk. The jury will assess the proposals in accordance with that information provided. In case a proposal does not comply with these guidelines, the verifier will annotate it into the protocol at the verification of proposals. Before commencement with the evaluation, the jury will be informed about the results of verification and will make a decision about their admission into evaluation. The jury will evaluate the proposals according to the Art. 12 of the Terms and Conditions. Is it necessary to submit the Agreement on Compliance with Conditions signed by various natural persons acting on behalf of the participant or it is enough with just one representant? In case acting on behalf of the participant - legal entity is defined in such a way that various natural persons are required to act together on participant’s behalf, names and surnames of all these natural persons shall be written in the participant’s details in the heading of the Agreement. Every one of these natural persons is required to make the guarantor’s promise (par. 2.5 and 2.6) and sign the Agreement. In case acting on behalf of the participant - legal entity is defined in such a way that only one natural person is required to act on participant’s behalf, name and surname of this natural person shall be written in the participant’s details in the heading of the Agreement, this natural person is required to make the guarantor’s promise (par. 2.5) and sign the Agreement. In case the participant is a natural person, the participant shall make the guarantor’s promise (par. 2.5) and sign the Agreement. I would like to ask about documents which have to be filled in. I am authorized architect, natural person, I have ID, which were assigned to me by Statistical office of the Slovak Republic. Are sections (registration in section, insert, register number) in Annex 2 relevant to me and must be filled in? In a case, that participant is natural person, named sections will be left empty. Is even partial intervention to original building reason for exclusion of proposal? I would like to ask, if it is possible to deliver 5 panels instead of 4. It is not possible. Former answers relevant to this question are answers no. 24 and 72. How announcer will be able to secure anonymity of the competition if contestant should send Annex 1 -3 and panels altogether in electronic form (even if there are two separate files named “panely s navrhom.pdf” and “ucastnik.pdf”), and simultaneously the announcer will have to verify if they were sent in paper form? That is possible only by opening the envelopes and verifying the document “ucastnik.pdf”, correct? Verifying of the proposals is provided by the verifiers named under clause 2.5 of Terms and Conditions during the time period between deadline for submission of proposals and the jury´s evaluation session. Verifiers keep the information regarding the identity of the participants and author confidential from the jury and the secretary. In the initial part of the jury´s evaluation session the main verifier will report results of verification process and answer any question of the jury, that will not lead to violation of the anonymity. Than he leaves the session. Remaining participants of the jury's evaluation session - the secretary, members of the jury and experts will not be able (before and during the evaluation) to know or to get identity of the participants and the authors of the evaluated proposals. This process is similar to verification of documents in other competitions, that were running before use of electronic procurement system. We inform participants, that the address of Slovak Chamber of Architects was changed recently and it is possible to use as return address for delivering of second part of proposal (clause 9.2 of Terms and Conditions) new address: Slovenská komora architektov, Námestie SNP 18, 811 06 Bratislava, Slovak republic. Use of the old address doesn't mean a problem, since Slovak Chamber of Architects still has access to its older inbox.